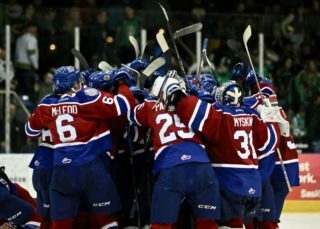 After five years, the Edmonton Oil Kings are headed back to the Eastern Conference Championship. 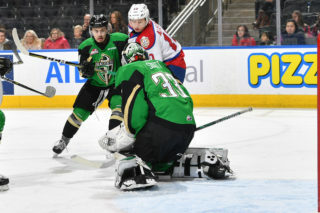 Dylan Myskiw made 18 saves to earn his first career playoff shutout as the Oil Kings (8-2) skated to a definitive 6-0 win over the Calgary Hitmen (4-5-2) in front of 3,472 fans – which included many enthusiastic Oil Kings supporters – at the Scotiabank Saddledome in Game 4 on Wednesday night. 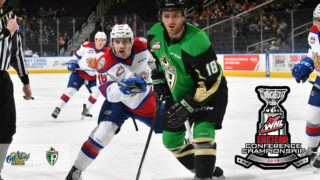 The Oil Kings win the best-of-seven Eastern Conference Semi-Final playoff series, 4-0, and await the winner of the other Eastern Conference Semi-Final series between the Prince Albert Raiders and Saskatoon Blades. The Blades evened their series, 2-2, after a 4-1 win over the Raiders on Wednesday night. 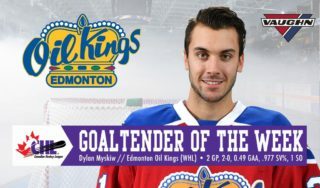 Myskiw (5-2-0) earned his fourth straight win, backstopping the Oil Kings to their first appearance in the conference finals since their 2014 WHL championship. 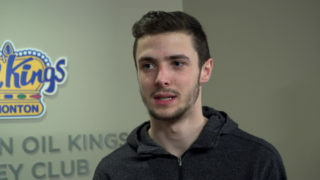 A night after nearly turning out an unblemished performance in a 2-1 overtime win, the Winnipeg, MB native accomplished the memorable feat and, in turn, did his part to punch his team’s ticket into the third round. His Calgary counterpart, Jack McNaughton (4-3-4), took the series deciding loss after allowing five goals on 25 shots. He was replaced to start the third period by Carl Stankowski, who surrendered one goal on eight Edmonton shots. 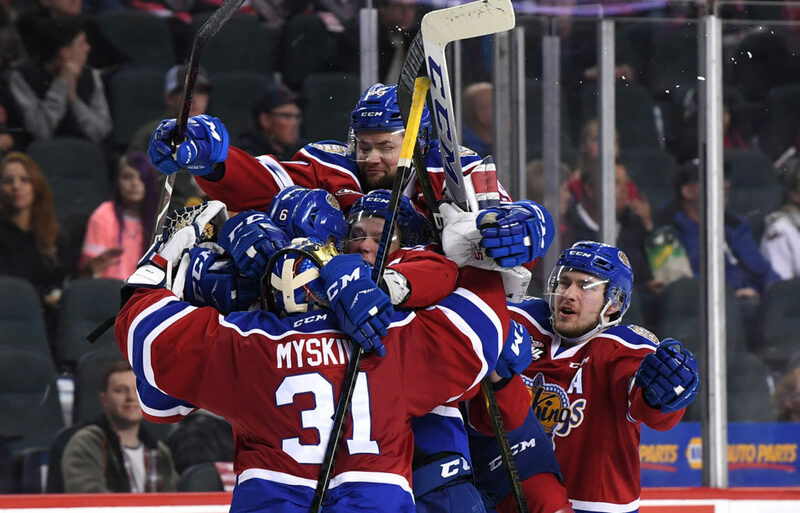 The Oil Kings had six different goal scorers on the night, and in fact, maintained that trend throughout every game of their second round series vs. the Hitmen with a balanced offensive contribution. Scott Atkinson, Quinn Benjafield, Jake Neighbours, Vince Loschiavo, Wyatt McLeod and Andrew Fyten each etched the scoresheet for Edmonton in Game 4, en route to the series victory. Atkinson gave the Oil Kings the 1-0 lead just under five minutes into the opening period, straddling the goal line and banking a rebound from a Vladimir Alistrov shot at 4:56 with Andrei Pavlenko earning the secondary assist. Before the period was out Benjafield would make it 2-0 with his fourth of the postseason, from Parker Gavlas, at 17:59. Shots on goal in the opening frame were 12-8, Edmonton. In the second, Neighbours extended the Oil Kings lead to 3-0 following a pretty play to himself between the legs and pushing the puck through the five hole of McNaughton, from Fyten and Ethan Cap at 7:40. Just 48 seconds later the Hitmen were whistled for what would be their only minor infraction of the game, but the Oil Kings would make them pay as Loschiavo made the most of a Benjafield pass and buried a one-timer from the high slot to make it a 4-0 Edmonton lead at 9:15, with the second helper to Conner McDonald. 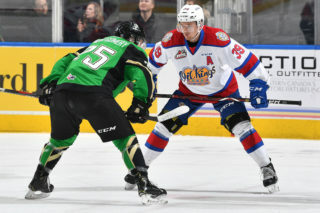 The Oil Kings would strike yet again in the closing minutes of the period, and McLeod would earn his second snipe in as many games. Zach Russell burst into the offensive zone on a 2-on-1 with Josh Williams, but despite plenty of patience with the puck Russell was stopped, yet McLeod was there to make good on the offensive chance to make it a 5-0 game at 17:38. Shots on goal in the second period were overwhelmingly in Edmonton’s favour by a margin of 17-2. Stankowski led the Hitmen to the ice to start the third, but was beaten by Fyten’s third of the playoffs on a pass from David Kope which rounded out the 6-0 final, with Neighbours earning the secondary assist at 5:53 of the third. Calgary was 0-for-2 on the power play, while Edmonton finished the game going 1-for-1 with the man advantage. Calgary overagers Jake Kryski (CGY) (3), Luke Coleman (CGY) (2), and Kaden Elder (CGY) (1) were selected as Three Stars of the Game.